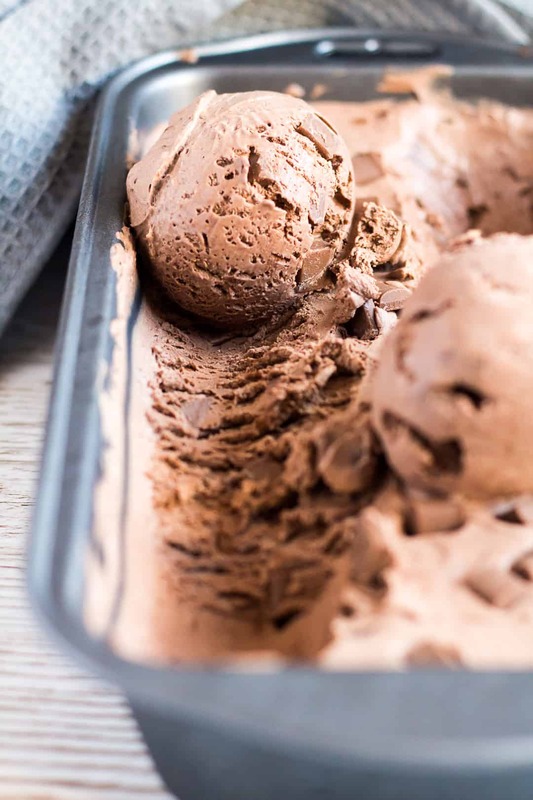 No-Churn Double Chocolate Ice Cream – A super easy recipe for chocolate ice cream that is no-churn, creamy, rich in flavour, loaded with chocolate chips, and only requires 4 simple ingredients to make! 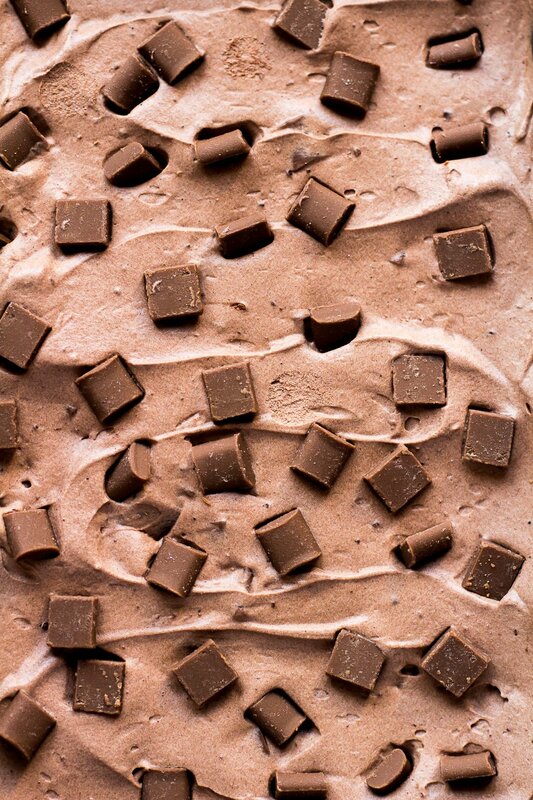 Guys, I think I’ve honestly found my most favourite chocolate ice cream recipe EVER. And it happens to be no-churn, and only requires 4 simple ingredients you most probably already have at home. If you’re a huge chocolate lover like me, you are going to fall in love with this one. Love raspberries? Go check out my favourite Raspberry Ripple Ice Cream recipe – it’s also no-churn! 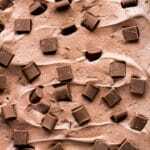 To make this chocolate ice cream recipe, simply whip the heavy cream to stiff peaks in a large mixing bowl. 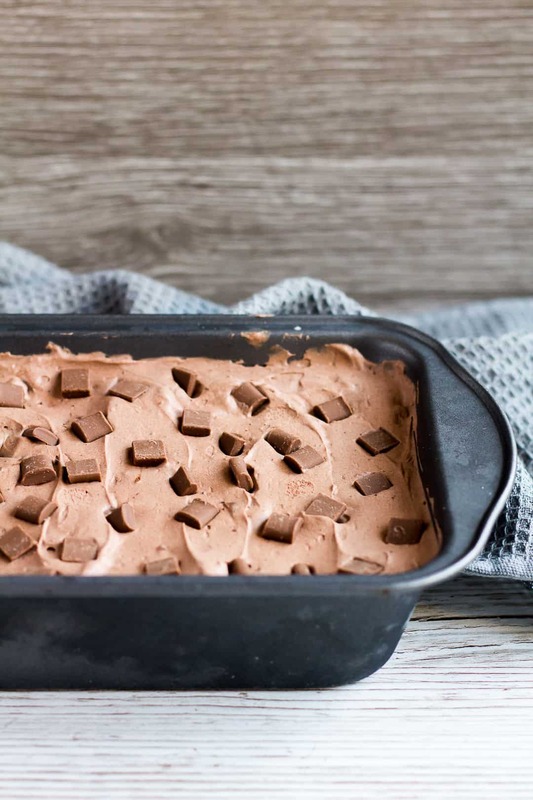 Add the condensed milk, cocoa powder, and chocolate chips, and fold in until completely combined. Pour the mixture into a 9×5-inch loaf pan, cover, and place in the freezer for at least 6 hours before serving. I like to keep mine in the freezer overnight, and serve out the next day. You can keep this ice cream in the freezer for up to 1 month. This ice cream is a chocolate lover’s dream dessert – I mean, I should know. 😉 It’s cool, refreshing, creamy… My partner Ben said it tastes like a rich chocolate gateau in ice cream form. I’ll take that as a win! Need more ice cream to feed a large crowd? You can easily double or triple this recipe into separate loaf pans. Want to only make a serving for two? Simply halve the recipe. Date night dessert – done! This is such a quick and easy recipe, yet SO incredibly delicious. It’s a real crowd-pleaser, and everyone will be going back for seconds – trust me. Try these delicious ice cream recipes next! Check out these milkshakes that are made with ice cream! 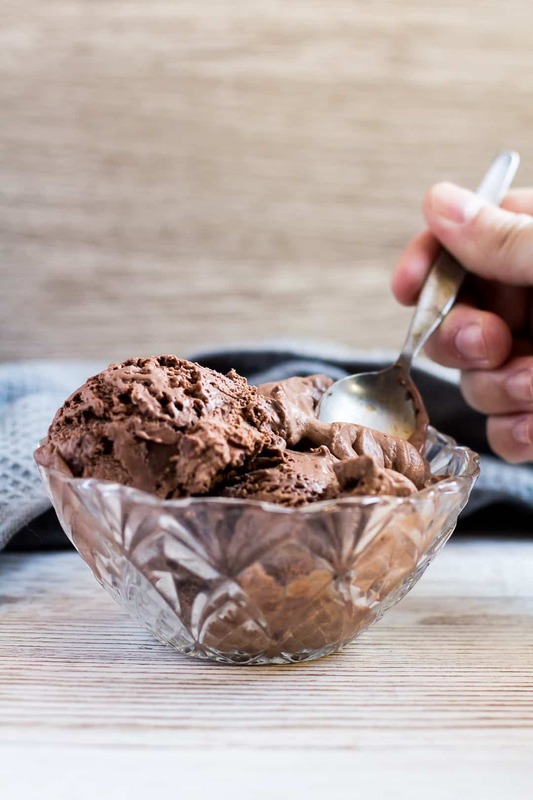 A super easy recipe for chocolate ice cream that is no-churn, creamy, rich in flavour, loaded with chocolate chips, and only requires 4 simple ingredients to make! Add the condensed milk, cocoa powder, and chocolate chips, and fold in until fully combined. 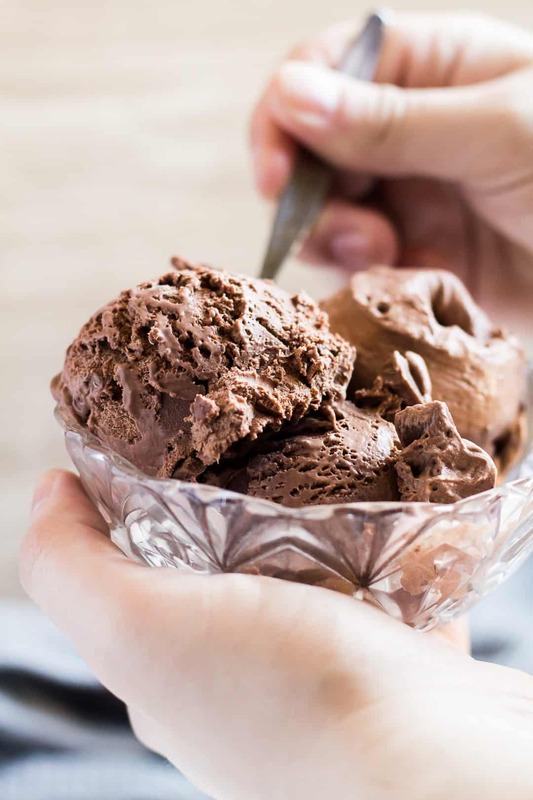 I consider myself an ice-cream connoissuer of sorts but have NEVER had chocolate ice-cream that I actually like – despite the fact that I LOVE chocolate. Like LOVE. Like the thought of chocolateless world makes me ache instead. …I hope your recipe proves me wrong. Hi, I’m new to your website, and like alot of the recipes that are on here. I’m just wondering if the calories in this double chocolate ice cream are per serving, or for all 6 or 8 servings. Welcome, Jenniffer! Per 8 servings. Made it over weekend – fabulous!! !